Colyton is located 43 kilometres west of the Sydney CBD in the local government area of Penrith City Council. Currently the median sales price of houses in the area is $643,000 with 67.4% of homes being owner occupied. The size of Colyton is approximately 3.4 square kilometres. It has 9 parks covering nearly 3.4% of the total area. The population of Colyton, recorded from the 2016 Census was 8,449. The predominant age group in Colyton is 30-39 years old. Households in Colyton are primarily couples with children and are likely to be repaying $1800 – $2399 per month on mortgage repayments. In general, the majority of people in Colyton work in a clerical occupation. 46.3% Couples with Children living at home , 28.9% Couples with no children living at home, 22.9% Single Parents, 0.9% Other. Colyton is the easternmost suburb of the City of Penrith. Its boundaries are Ropes Creek, the Great Western Highway, Marsden Road and the M4 Western Motorway. Colyton is one of the older suburbs in the St Marys area with homes on large blocks of land – primarily 1/4 acre and 1/3 acre blocks. Colyton is named after Colyton in Devon, England, which had been the home town of the wife of William Cox Junior, son of the famous builder of the road across the Blue Mountains, also named William. 69.6% of residents were born in Australia. The most common other countries of birth were England 2.6%, Philippines 2.5% and Fiji 2.3%. The most common occupations in Colyton included Clerical and Administrative Workers 19.1% and Machinery Operators And Drivers 14.5%. 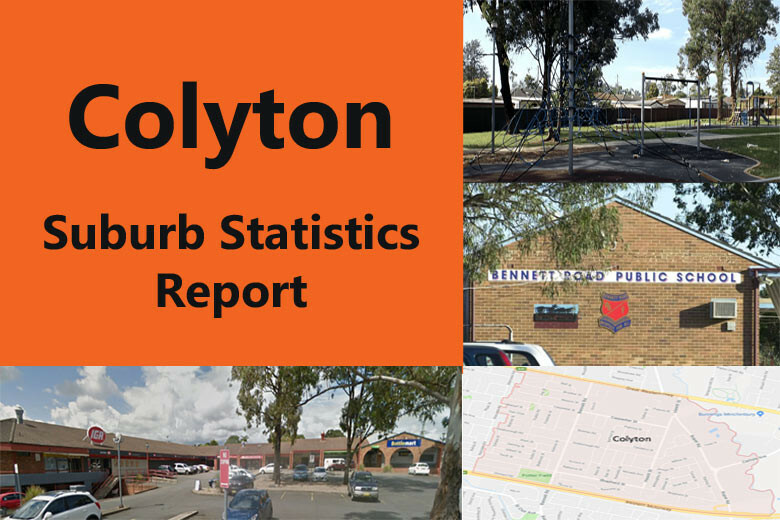 Click here to download the full 20 page Colyton Suburb Report as a pdf.